Super 8 Allentown is the closest hotel to the newly constructed Coca-Cola Park, home of the Ironpigs Baseball team, a Philadelphia Phillies affiliate. We are also the closest Super 8 to Dorney Park and Wild Water Kingdom. This property is only 6 miles to the new Sands Casino! 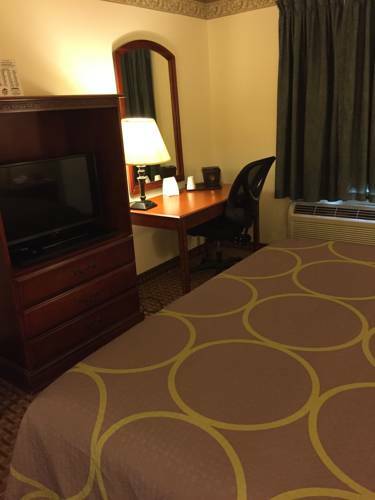 Located one mile from the Lehigh Valley International Airport and minutes from Dorney Park, on Airport Road. Join us to enjoy one of the many baseball games, festivals, concerts or attractions Allentown is known for. Enjoy a great nights rest in any of our comfortable rooms featuring either one king bed or two queen beds, you may also upgrade to a Jacuzzi Suite. All our guests are invited to join us for a Free Super Start Breakfast, and access Free High Speed Wireless Internet from anywhere in the hotel. All our rooms feature micro fridges, coffee makers, hair dryers and 27 inch TVs featuring HBO, CNN and ESPN. We DO NOT allow pets of any kind in the rooms and appreciate your cooperation. Eight-story, Japanese-style brick and tile structure on Mount Penn, 886 feet above Reading.